Handling a crisis when it comes the media can make you, or break you. 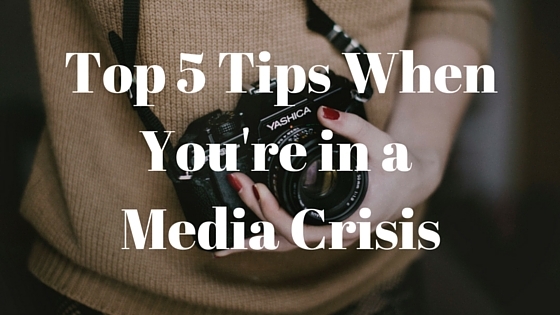 Here are 5 tips to help you move through a crisis situation unharmed when it comes to the media. The media have covered every crisis imaginable. They can sense dishonesty from a mile away. If you dont have all the information at hand, tell them. If there has been a change in situation, tell them. Honesty is the key when it comes to a crisis. It builds your reputation with the media, and it ensures your brand has a chance of recovery when the crisis is over. Just as important as being honest, if your company has made a mistake, its important to be accountable. The media, and more importantly consumers, appreciate a business that is willing to face up to its mistakes. There have been so many cases (too many to mention) where being accountable and facing up to the truth has led to positive outcomes for the business over the longer term. Most important in a crisis, you should be responding ad hoc, or without thought. Formulate your key messages, what you want to say to the media before you speak. This way messages throughout the crisis are consistent, and if consumer perceptions need to be changed, you can have some control of the messages being sent to your customers. If this point has left you a little confused, its become clear you dont have a crisis management plan. Preparing a crisis management plan during the non-crisis days will help you during your crisis. These plans are critical in making decisions about who your spokesperson will be, what the process will be to formulate some key messages to roll out during the crisis, and who the key media agencies are to get your message out there effectively during the crisis. If you dont have a Crisis Management Plan for your business, hire an agency to prepare one for you, or commence drafting once yourself. Planning for a crisis is the key to brand survival. Your employees and your loyal customers are the ambassadors for your company. Keep them informed, they will be a valuable ally in keeping information accurate in the community, and maintaining your brand. In addition to press releases and media contact, during a crisis newsletters, or briefing notes to your employees and customers are a must. Devahasdin has a wealth of experience in crisis management. Telephone us on 9226 2222 or email info@devahasdin.com.au for an obligation free discussion.